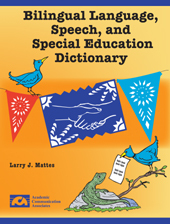 The Bilingual, Language, Speech, and Special Education Dictionary includes terms used by speech-language pathologists, audiologists, and special education specialists in English and Spanish. Terms such as aphasia, learning disability, speech-language pathologist, reading disability, articulation disorder, and stuttering are included. This dictionary is larger and more comprehensive than the Bilingual>Speech, Language, and Hearing Dictionary that we also have available. It includes terms from that dictionary and many more. The new 8.5" x 11" page size makes it easy to write in additional terms or to make modifications for the local dialect. Every school should have this easy-to-use dictionary. Each term is listed in both an English-Spanish section and a Spanish-English section. Terms relevant to writing IEP objectives and communicating with parents are among those included in this easy-to-use resource.